Your first class is only $10. After your first class you will need to purchase a class or package at full price to attend another class. * Can I just show up and take a class? We recommend that you reserve a spot in class. There are a limited amount of spots in each class and if you just show up there is no guarantee that you will be able to participate. We recommend wearing good walking or running shoes and comfortable workout clothing. You should bring a water bottle. We will have water for refills, towels, mats and equipment. We will provide 1 towel per client. If you would like additional towels please bring your own. We do not sell bottled water. *Why do I need to arrive early? You should arrive early to allow yourself time to sign the waiver, meet your instructor, have the class and equipment explained to you, and we can show you around the gym. If it is your first class and you do not arrive early we will not be able to delay class to explain the class. 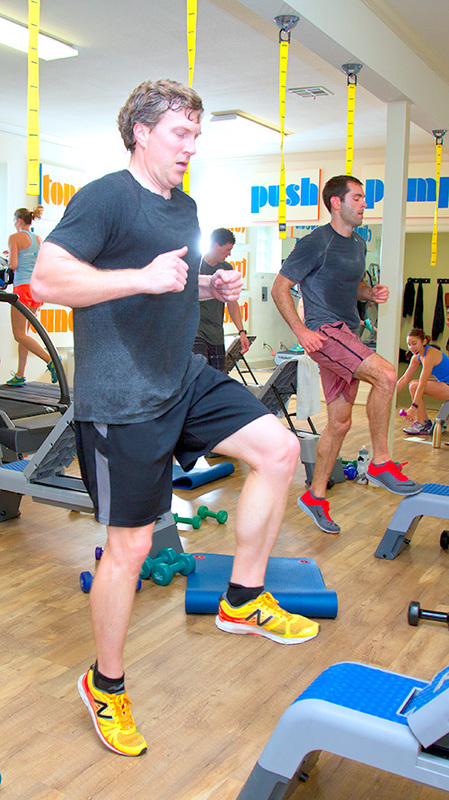 Each class is led by an instructor who will guide you through the workout. Each class is divided into two groups, working simultaneously through timed intervals. One group will start on the treadmill and the other starts with floor work. The interval times and equipment used on the floor changes each day. This variety and high intensity interval training (HIIT) format will have you in the best shape of your life! *Do I have to run? You do not have to run on the treadmill. We offer a slow, medium and fast speed as guidelines during the class. You know your body and what you are ready for. However, we will be there to help motivate you to push yourself out of your comfort zone and give 110%! How many classes a week are recommended? For the fastest results, we recommend taking 2-4 classes per week. I’ve never exercised before. Will I be ok? If you have never worked out before we recommend scheduling a one on one session before taking a class. Our instructors provide verbal cues and visual demonstrations on form but in a full class they are NOT able to provide a personal training experience. Once you have the basics down we would love to see you in class! Do you offer personal training at the studios? We have the ability to personal train at the studio outside of class times. All of our instructors are certified personal trainers. I’ve recently had a baby. Am I ok to take a class? Hour Blast is a great place to get back in shape after delivery! Check with your physician before attending your first class to make sure you are OK to start exercising. We recommend pacing yourself the first couple of classes. We promise with your dedication and our workouts we will get you in shape in record time! Please consider purchasing the Bounce Back after Baby package to help you lose those extra pounds all moms put on during pregnancy. I am recovering from an injury. Am I ok to take a class? As long as your physician has cleared you to workout you should be OK. Before class begins check in with the instructor to make her aware of any limitations you have and for her to see what modifications you need in the class. Remember, there are 14 other clients in class so the instructor will not be able to provide you with modifications on every exercise. On the treadmill you are ultimately in control, our numbers are just guidelines. Listen to your body to set your pace and incline. Make the workout your own, we just want you moving! Do I need to become a member to take a class? No membership required. All classes are purchased in single or class packages. Please see our pricing section to see the packages we offer. You can buy classes online or in person in the gym. We accept cash, check and most credit cards. Yes. All packages will expire one year from purchase date, with the exception of the 50 class package, which will expire after two years. What if I move, can I get a refund? Can I transfer classes between locations? No. Classes are non-transferable. The packages must be used at the location where purchased. How do I book, cancel, or reschedule a class? You can book, cancel or reschedule online at hourblast.com. Simply click on the “sign up for class” link to take you to the schedule. You will need to register and create an account with “mind-body” website. Please make sure you are scheduling a class at the location where you want to take a class. I made a reservation at the 8:15 but now I want to come to the 9:30. Can I move my reservation time? Yes, only if within the same day and if a spot is available and if your original class was not full/had a waitlist. How far in advance can I reserve my spot in class? We post the new schedule on the 15th of each month for the following month of classes. Once the schedule is up you are able to reserve a spot. Hour Blast has a 12 hour cancellation policy. Cancellations must be made 12 hours prior to class to avoid being charged. This applies to all packages. I reserved a spot in class but when I showed up a few minutes late my spot was gone. Why? Can I get my class back? We ask that you please arrive on time as a courtesy to the instructor and other class participants. It is Hour Blast’s policy to allow a client waiting in studio to receive the spot of a late client. If you do arrive late we will refund the class, but you will not be able to participate once your spot has been given away. If you do not arrive your class will not be refunded. The website says I am on the waitlist for a class. How does this work? If you sign up for the waitlist you are saying that you are able to attend the class. If you receive an email 12 hours prior to class beginning, you are responsible for confirming or removing yourself from the class if you are no longer able to attend. If you receive an email after the 12 hour mark, you will not be charged if you do not make it to class. Do not rely on the email. It is your responsibility to check to see if you have been added to a class. If you have opted out of emails you will not receive the wait list notification email or reservation reminders. Can I share a package with my spouse, family member, friend? Packages can be shared amongst spouses/family members, with the exception of the monthly unlimited. Packages cannot be shared amongst friends. We do not offer childcare at either gym. Do you have a question that we missed?! Contact us today and we will be happy to answer all of your questions!